This kit is about what art does for you. You can create art alone or you can create art with others. You can make art in complete silence or while listening to your favorite tunes. Art can help lift your spirits by taking you away from the stresses of life; it can help you deal with difficult issues; or it can act as therapy when your heart needs to heal. Art can be an interesting experimentation or a very intentional process. Or, you can create art simply for the pure joy of creating art. 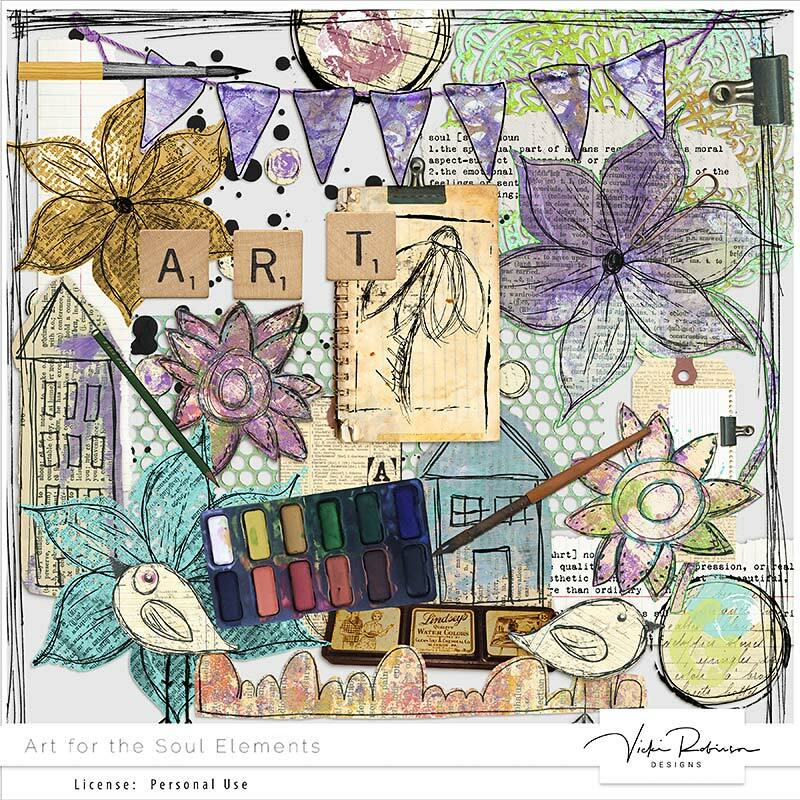 No matter how you look at it, art is for your soul and this delightfully whimsical and mostly hand-painted and is just what you need to create some beautiful art! 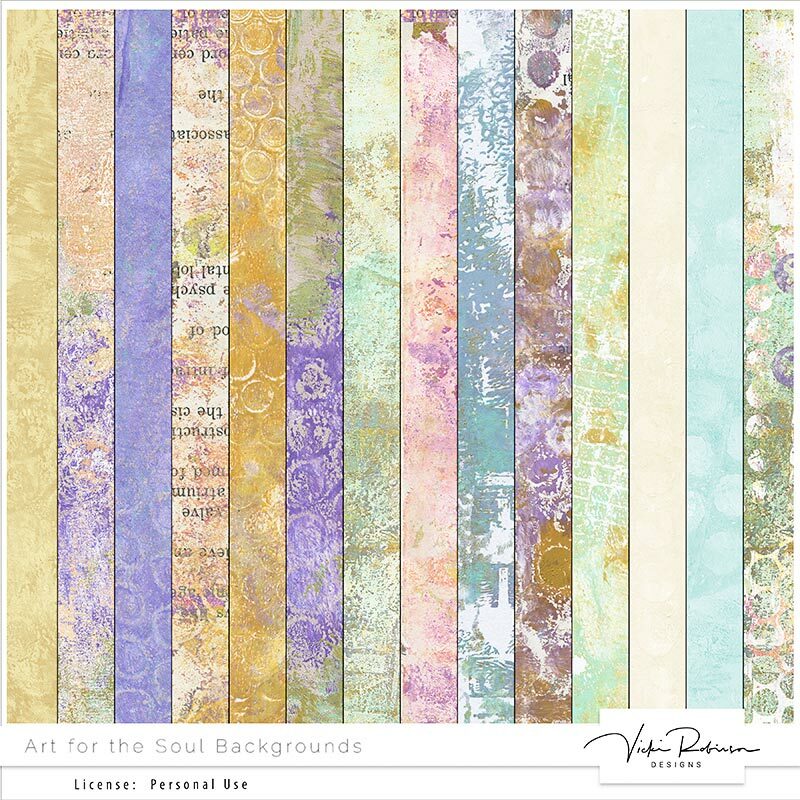 You may wish to purchase the full Art for the Soul Collection - one of my value deals - because it includes the elements and backgrounds in the product, but you also get a pack of doodles/stamps, word art and a set of rubber stamp alpha brushes. Check your stash carefully as this product was sold in other stores and was original part of a collaboration. All images are 300 ppi. Product has been specifically designed for use with Adobe Photoshop and Adobe Photoshop Elements software. PNG and JPEG files are generally compatible with other graphics programs. Brush PNG files are provided in black - any color in previews is for demonstration purposes. License: PERSONAL USE. This license allows you to use this product for your personal needs only. With this license, you may create things for yourself and your family and friends for which you receive no compensation. You may NOT resell or distribute this product in any form under this license and this license is NOT transferrable.